It’s a tough issue to deal with on a daily basis from the comfort of our own homes and routines, but how can we continue to make a positive difference on the road? Think back to the baby dolphin selfie scandal. How many people do you think were standing on the Argentinian beach watching in horror as the poor baby dolphin was passed around and didn’t do a thing? Plenty, I am sure. How many took action? Not one. As with any form of animal abuse, the approach depends of the situation (and possibly the cultural/social norms of the country you are in.) In any situation you think an animal is suffering, it is YOUR responsibility to take action – call the police or a local animal aid agency, report the situation to PETA, talk to and respectfully discuss the situation with the people holding the animal captive, use social media to create action, or even intervene if you consider it safe to do so. Would that baby dolphin still be alive if someone had used their turn at taking a selfie to rush the poor thing back to the water so it could swim free? We’ll never know. We have all heard about recycling. But who really takes time to think or act, especially on the road? Where possible say no to plastic bags, bottles and print outs, not only for the sake of the planet but to keep things simple – who needs all that rubbish floating around the bottom of their backpack anyway? If you cannot refuse, at least reuse. Hold onto your drink bottle and refill it until it falls apart or wrap up your dirty laundry in that spare plastic bag, and always ALWAYS dispose of rubbish thoughtfully, no matter where you are! And if you can’t dispose of waste correctly, carry it with you until you find a suitable disposal site. Nobody wants a pristine beach or sacred site ruined with litter, or a seal or seabird to choke to death so take responsibility of your rubbish! We all, at some point in our travelling careers, have stumbled into an undesirable animal welfare situation. Take pictures, learn, discuss. Use your pictures, your words, knowledge and emotions to conjure up respect for these animals – remember when I stumbled upon a Kopi Luwak operation in Bali? I practically choked on my own despair but instead of keeping it to myself, I blogged about it and got a pretty awesome response. Talk to the captor, the other tourists and explain your objections and reservations. Education is the best means to end animal cruelty, so instead of simply witnessing the abuse while dealing with personal fits of agony and hopelessness blaming yourself for being there, use your mistakes to make amends. Tell everyone you meet on the road not to visit such a place, and use your experiences to bring justice to these animals we must fight so hard for! You owe it to yourself to research where you are going and what experiences this may lead to. 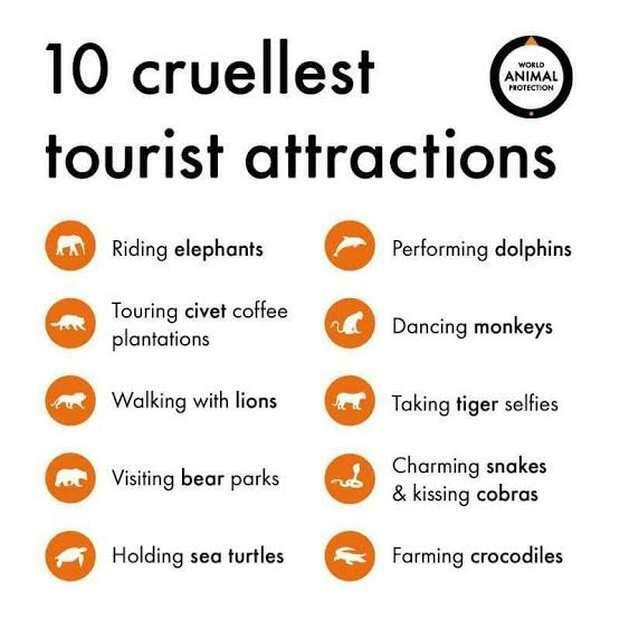 If you are thinking of going to an animal related tourism venture, check out tripadvisor, social media and the company’s website to see how they treat the animals in their care. Ensure you are only going to responsibly owned and operated animal facilities and sanctuaries, and never allow yourself to pet, ride, swim with, feed, touch or cuddle a wild animal. I know we are not all perfect, not even myself, but if you’ve partaken in one of these activities, use your experiences and knowledge to educate others. Have a look at this video about breaking an elephant’s spirit, for the sake of tourism and labour. Please be aware this video has images most will find disturbing. Of course, we cannot always do something to help, whether it is financial, time, or cultural infringement constraints, but if you feel as though you can, it is safe to do so, and you are comfortable to do so – HELP. Do something. Anything. For example, the most important thing I have done in my life to date is without a doubt, saving Hope, a stray dog in Myanmar. If you want to see animals on your holiday, do it responsibly. Visit renowned National Parks, Conservancies, Eco-Tourism Operations and Sanctuaries. There is nothing more beautiful than interacting with nature, seeing wild animals IN THE WILD. Just remember, if it doesn’t feel right, it probably isn’t.